"Ancient mariner" and "Ancient Mariner" redirect here. For rum based cocktail, see Ancient Mariner (cocktail). For the 1975 film, see Rime of the Ancient Mariner (film). For the 1925 silent film, see The Ancient Mariner (film). The mariner up on the mast in a storm. One of the wood-engraved illustrations by Gustave Doré of the poem. The Rime of the Ancient Mariner (originally The Rime of the Ancyent Marinere) is the longest major poem by the English poet Samuel Taylor Coleridge, written in 1797–98 and published in 1798 in the first edition of Lyrical Ballads. Some modern editions use a revised version printed in 1817 that featured a gloss. Along with other poems in Lyrical Ballads, it is often considered a signal shift to modern poetry and the beginning of British Romantic literature. The Rime of the Ancient Mariner relates the experiences of a sailor who has returned from a long sea voyage. The mariner stops a man who is on his way to a wedding ceremony and begins to narrate a story. The wedding-guest's reaction turns from bemusement to impatience to fear to fascination as the mariner's story progresses, as can be seen in the language style: Coleridge uses narrative techniques such as personification and repetition to create a sense of danger, the supernatural, or serenity, depending on the mood in different parts of the poem. They soon find that they made a grave mistake in supporting this crime, as it arouses the wrath of spirits who then pursue the ship "from the land of mist and snow"; the south wind that had initially led them from the land of ice now sends the ship into uncharted waters near the equator, where it is becalmed. Engraving by Gustave Doré for an 1876 edition of the poem. "The Albatross" depicts 17 sailors on the deck of a wooden ship facing an albatross. Icicles hang from the rigging. Eventually, the ship encounters a ghostly hulk. On board are Death (a skeleton) and the "Night-mare Life-in-Death", a deathly-pale woman, who are playing dice for the souls of the crew. With a roll of the dice, Death wins the lives of the crew members and Life-in-Death the life of the mariner, a prize she considers more valuable. Her name is a clue to the mariner's fate: he will endure a fate worse than death as punishment for his killing of the albatross. Finally the mariner comes in sight of his homeland, but is initially uncertain as to whether or not he is hallucinating. After relaying the story, the mariner leaves, and the wedding guest returns home, and wakes the next morning "a sadder and a wiser man". The poem received mixed reviews from critics, and Coleridge was once told by the publisher that most of the book's sales were to sailors who thought it was a naval songbook. Coleridge made several modifications to the poem over the years. In the second edition of Lyrical Ballads, published in 1800, he replaced many of the archaic words. 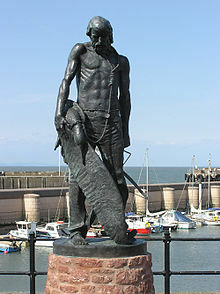 Commemorative statue at Watchet, Somerset: the albatross hangs on a rope looped around the ancient mariner's neck. The poem may have been inspired by James Cook's second voyage of exploration (1772–1775) of the South Seas and the Pacific Ocean; Coleridge's tutor, William Wales, was the astronomer on Cook's flagship and had a strong relationship with Cook. On this second voyage Cook crossed three times into the Antarctic Circle to determine whether the fabled great southern continent existed. Critics have also suggested that the poem may have been inspired by the voyage of Thomas James into the Arctic. We all observed, that we had not the sight of one fish of any kind, since we were come to the Southward of the streights of le Mair, nor one sea-bird, except a disconsolate black Albatross, who accompanied us for several days ... till Hattley, (my second Captain) observing, in one of his melancholy fits, that this bird was always hovering near us, imagin'd, from his colour, that it might be some ill omen ... He, after some fruitless attempts, at length, shot the Albatross, not doubting we should have a fair wind after it. As they discussed Shelvocke's book, Wordsworth proffers the following developmental critique to Coleridge, which importantly contains a reference to tutelary spirits: "Suppose you represent him as having killed one of these birds on entering the south sea, and the tutelary spirits of these regions take upon them to avenge the crime." By the time the trio finished their walk, the poem had taken shape. Bernard Martin argues in The Ancient Mariner and the Authentic Narrative that Coleridge was also influenced by the life of Anglican clergyman John Newton, who had a near-death experience aboard a slave ship. The poem may also have been inspired by the legends of the Wandering Jew, who was forced to wander the earth until Judgement Day for a terrible crime, found in Charles Maturin's Melmoth the Wanderer, M. G. Lewis' The Monk (a novel Coleridge reviewed) and the legend of the Flying Dutchman. It is argued that the harbour at Watchet in Somerset was the primary inspiration for the poem, although some time before, John Cruikshank, a local acquaintance of Coleridge's, had related a dream about a skeleton ship manned by spectral sailors. In September 2003, a commemorative statue, by Alan B. Herriot of Penicuik, Scotland, was unveiled at Watchet harbour. "The Albatross about my Neck was Hung," etching by William Strang. Poem illustration published 1896. The thought suggested itself (to which of us I do not recollect) that a series of poems might be composed of two sorts. In the one, incidents and agents were to be, in part at least, supernatural, and the excellence aimed at was to consist in the interesting of the affections by the dramatic truth of such emotions, as would naturally accompany such situations, supposing them real. And real in this sense they have been to every human being who, from whatever source of delusion, has at any time believed himself under supernatural agency. For the second class, subjects were to be chosen from ordinary life...In this idea originated the plan of the 'Lyrical Ballads'; in which it was agreed, that my endeavours should be directed to persons and characters supernatural, or at least Romantic; yet so as to transfer from our inward nature a human interest and a semblance of truth sufficient to procure for these shadows of imagination that willing suspension of disbelief for the moment, which constitutes poetic faith. ... With this view I wrote the 'Ancient Mariner'. Mrs Barbauld once told me that she admired The Ancient Mariner very much, but that there were two faults in it -- it was improbable, and had no moral. As for the probability, I owned that that might admit some question; but as to the want of a moral, I told her that in my own judgement the poem had too much; and that the only, or chief fault, if I might say so, was the obtrusion of the moral sentiment so openly on the reader as a principle or cause of action in a work of such pure imagination. It ought to have had no more moral than the Arabian Nights' tale of the merchant's sitting down to eat dates by the side of a well, and throwing the shells aside, and lo! a genie starts up, and says he must kill the aforesaid merchant, because one of the date shells had, it seems, put out the eye of the genie's son. From what I can gather it seems that the Ancient Mariner has upon the whole been an injury to the volume, I mean that the old words and the strangeness of it have deterred readers from going on. If the volume should come to a second Edition I would put in its place some little things which would be more likely to suit the common taste. The Poem of my Friend has indeed great defects; first, that the principal person has no distinct character, either in his profession of Mariner, or as a human being who having been long under the control of supernatural impressions might be supposed himself to partake of something supernatural; secondly, that he does not act, but is continually acted upon; thirdly, that the events having no necessary connection do not produce each other; and lastly, that the imagery is somewhat too laboriously accumulated. Yet the Poem contains many delicate touches of passion, and indeed the passion is every where true to nature, a great number of the stanzas present beautiful images, and are expressed with unusual felicity of language; and the versification, though the metre is itself unfit for long poems, is harmonious and artfully varied, exhibiting the utmost powers of that metre, and every variety of which it is capable. It therefore appeared to me that these several merits (the first of which, namely that of the passion, is of the highest kind) gave to the Poem a value which is not often possessed by better Poems. Upon its release, the poem was criticized for being obscure and difficult to read. The use of archaic spelling of words was seen as not in keeping with Wordsworth's claims of using common language. Criticism was renewed again in 1815–16, when Coleridge added marginal notes to the poem that were also written in an archaic style. These notes or glosses, placed next to the text of the poem, ostensibly interpret the verses much like marginal notes found in the Bible. There were many opinions on why Coleridge inserted the gloss. Charles Lamb, who had deeply admired the original for its attention to "Human Feeling", claimed that the gloss distanced the audience from the narrative, weakening the poem's effects. The entire poem was first published in the collection of Lyrical Ballads. Another version of the poem was published in the 1817 collection entitled Sibylline Leaves (see 1817 in poetry). On a surface level the poem explores a violation of nature and the resulting psychological effects on the mariner and on all those who hear him. According to Jerome McGann the poem is like a salvation story. The poem's structure is multi-layered text based on Coleridge's interest in Higher Criticism. "Like the Iliad or Paradise Lost or any great historical product, the Rime is a work of transhistorical rather than so-called universal significance. This verbal distinction is important because it calls attention to a real one. Like The Divine Comedy or any other poem, the Rime is not valued or used always or everywhere or by everyone in the same way or for the same reasons." 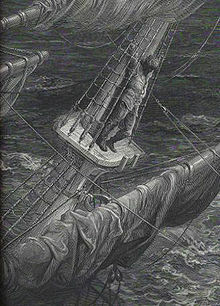 George Whalley, in his 1946–47 essay, "The Mariner and the Albatross", suggests that the Ancient Mariner is an autobiographical portrait of Coleridge himself, comparing the mariner's loneliness with Coleridge's own feelings of loneliness expressed in his letters and journals. In addition to being referred to in several other notable works, due to the popularity of the poem the phrase "albatross around one's neck" has become an English language idiom referring to "a heavy burden of guilt that becomes an obstacle to success". 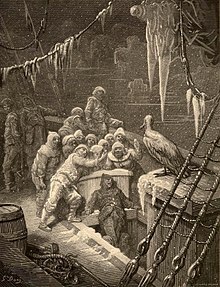 Monty Python's "Albatross Sketch"  in which an irascible movie-theatre refreshment vendor tries to sell a single albatross from a tray around his neck, is a parody of Coleridge's description of the Mariner. The phrase "Water, water, every where, | Nor any drop to drink" has appeared widely in popular culture, but usually given in a more natural modern phrasing as "Water, water, everywhere | But not a drop to drink"; some such appearances have, in turn, played on the frequency with which these lines are misquoted. The poem is referenced in the script of the 1939 film The Adventures of Sherlock Holmes. The Iron Maiden song "Rime of the Ancient Mariner" from their fifth studio album Powerslave (1984) was inspired by and based on the poem, and quotes the poem in its lyrics. A 1971 episode of Rod Serling's television series Night Gallery pays homage to the poem in an episode entitled "Lone Survivor." In it the RMS Lusitania picks up a lone survivor drifting in a lifeboat from the RMS Titanic, despite the great ship having sunk three years before. The man tells them he escaped the Titanic by dressing as a woman and as a result of his selfish act he must forever drift from doomed ship to doomed ship. The man warns the crew of the Lusitania that the ship will be torpedoed. They do not believe him until the Lusitania is hit and begins to sink. The man is then seen adrift in a Lusitania lifeboat only to be picked up decades later by the SS Andrea Doria. ^ Cooke, Alan (2000). "Thomas James". Dictionary of Canadian Biography Online. Retrieved 5 March 2007. ^ a b Keach, William (ed. ): "The Complete Poems / Samuel Taylor Coleridge", pages 498–99. Penguin, 1997. ^ John Clute and John Grant, eds. (1999). The encyclopedia of fantasy. Macmillan. p. 210. ISBN 978-0-312-19869-5. CS1 maint: Uses editors parameter (link) Excerpt available at Google Books. ^ "Samuel Taylor Coleridge". poetryfoundation.org. 11 December 2016. Retrieved 12 December 2016. ^ "Coleridge and Watchet – Watchet Museum". watchetmuseum.co.uk. Retrieved 12 December 2016. ^ Coleridge, Samuel Taylor. "Chapter XIV". Biographia Literaria. Retrieved 12 May 2013. ^ "GradeSaver: The Rime of the Ancient Mariner-Study Guide – About The Rime of the Ancient Mariner". ^ McGann, Jerome J. The Beauty of Inflections: Clarendon Press, 1985. ^ "albatross around one's neck". Houghton Mifflin. 1997. ^ Chadner (14 September 2008). "Monty Python - Albatross" – via YouTube. ^ "Ten literary quotes we all get wrong". The Telegraph. Retrieved 26 July 2016. ^ "Adventures of Sherlock Holmes, The (1939) Movie Script - SS". Springfield! Springfield!. ^ "Rime Of The Ancient Mariner by Iron Maiden Songfacts". www.songfacts.com. ^ Muir, John Kenneth. "Terror Television: American Series 1970-1999". Scott, Grant F. "'The Many Men so Beautiful': Gustave Doré's Illustrations to 'The Rime of the Ancient Mariner,'" Romanticism 16.1 (2010): 1–24. 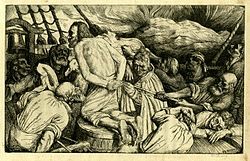 Wikimedia Commons has media related to The Rime of the Ancient Mariner. "The Destruction of the Bastile"
"Monody on the Death of Chatterton"
This page was last edited on 2 April 2019, at 23:53 (UTC).